While Say on Pay is voluntary in Canada, many S&P/TSX 60 companies held Say on Pay votes in 2016. In contrast to the mandatory (but non-binding) advisory votes on executive compensation (“Say on Pay” votes) in the U.S., Say on Pay remains voluntary in Canada. Close to 80% of the S&P/TSX 60 companies have a Say on Pay vote – a level that has remained fairly stable for the last few years. The S&P/TSX 60 companies that have not adopted Say on Pay are generally closely held or controlled companies. Participation rates among the broader S&P/TSX Composite companies are continuing to increase, to approximately 56% of Composite companies so far in 2016 (up from 48% in 2015). Overall participation by Canadian companies has increased by about 20% in the last year, and we expect that rates will continue to trend upward, particularly among mid- to large-cap companies. 2016 voting patterns among S&P/TSX 60 companies look a lot like results from 2014, with about two-thirds of companies receiving at least 90% support. However, strong support for Say on Pay is much lower than in 2015, due primarily to the number of proxy advisor recommendations “Against” Say on Pay. The pattern in Canada for the last several years has been for the vast majority of companies to receive at least 70% support. 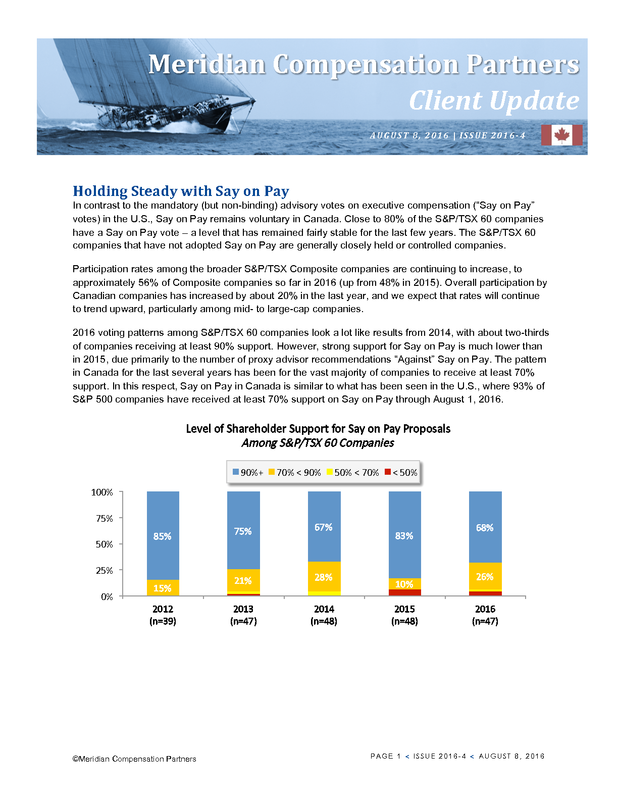 In this respect, Say on Pay in Canada is similar to what has been seen in the U.S., where 93% of S&P 500 companies have received at least 70% support on Say on Pay through August 1, 2016. Last year there were three very public Say on Pay failures among S&P/TSX 60 companies – at Barrick Gold, CIBC, and Yamana Gold. All three of those companies held Say on Pay votes again in 2016, and all three votes passed this time, with 87% – 96% support. Canadian Pacific Railway just barely failed, with 49.9% of shareholders voting in favour of Say on Pay. Proxy advisory firms Institutional Shareholder Services (ISS) and Glass Lewis both recommended a vote “Against” Say on Pay. ISS took issue with the size of the CEO’s pay package compared to total shareholder return (TSR) performance and noted “significant concerns” with the design of the incentive compensation program, including the rigour of the annual incentive plan goals, assessment of the individual performance component for the CEO at “Maximum”, significant compensation paid to a short service CFO, sign on awards for the new CFO, personal use of company aircraft, and long-term award grant values that were targeted to the 75th percentile of peer values. Crescent Point Energy failed by a more significant margin, with only 31% support from shareholders. The company made changes to its program in 2014 following 2013 vote results that were below 60% (still a passing grade, but in the “yellow card” zone of 50% – 70% support). ISS’s “Against” vote recommendation was driven primarily by high CEO pay coupled with low TSR performance compared to peers. 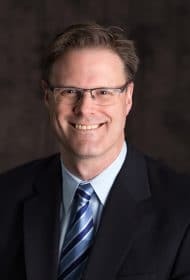 ISS also cited the “overly complex” pay structure in place, and design features that weaken the pay-for-performance linkages in long-term compensation. Other notable vote results in the “yellow card” zone include Valeant Pharmaceuticals (62% support), Alamos Gold (65%), and RioCan REIT (67%). ISS recommended against the ballots at all three companies. In 2016, ISS recommendations “Against” Say on Pay jumped up to 8.3% of all Canadian companies holding votes so far this year, up significantly compared to 2015’s 4.9%. Among companies where ISS recommended “For” Say on Pay, average shareholder support was 94%. By contrast, companies receiving an “Against” vote recommendation had average support of 67% (or 74% based just on companies that passed their Say on Pay votes). A 25-30 point swing is generally consistent with the impact that an ISS vote recommendation can have in the U.S., although the impact in Canada this year is less than in 2015 (when an ISS “Against” recommendation was associated with shareholder support that was nearly 40 points lower). Increasingly, however, we are seeing that the extent of ISS’s influence depends to a large degree on the composition of a company’s investor base. Larger investors in particular tend not to be straight-ticket voters along proxy advisor lines, but have their own policies and will conduct their own proprietary research prior to making voting decisions. Engaging in regular outreach with major investors on pay-related issues as a matter of normal business activities (not solely when there is a pay-related hot button issue).